By Reginald A. Ray, Ph.D.
My principal meditation teacher was Chögyam Trungpa Rinpoche, one of the first Tibetan lamas to present meditation in the West. During the 17 years that I knew him, from 1970 until his death in 1987, he transmitted the somatic Vajrayana lineage to me and his other senior students. Since his death, I have been fortunate to have the time and the opportunity to explore extensively Rinpoche’s transmission through study, practice—and most importantly, teaching—where I have learned the most. One single concept best characterizes the instruction that Rinpoche received from his teachers and that he wanted to pass on to his students: “embodied spirituality.” But in using this term, what are we talking about? The somatic approach teaches that the spiritual is already, from the beginning, implicit within what we call the material—not only in our own physical body but also (as we shall discuss further below) in the larger body of our incarnate situation in the cosmos. This means that the essential nature of our incarnational materiality, both what is inside (body) and what is outside (cosmos), is already primordially and inherently spiritual. The somatic view of Vajrayana Buddhism has revolutionary implications for our meditation practice as modern people and for our spiritual journey altogether. As mentioned, it means that our spiritual life, far from involving a distancing and separating from our body and all the realities of our physical incarnation, requires just the opposite: we must turn toward our body and our life as the proper and only possible arena for authentic spiritual development—as the only place where our path can unfold and as the only possible true access point for our genuine realization. Anything else is a chimera, a dream. When I talk about embodied spirituality in the book, The Awakening Body, then, I mean that connecting with our body and our ordinary life are not add-ons: they are the practice of spirituality; they are what the spiritual journey is all about. The somatic point of view is that the spiritual journey can only really begin within the depths of our incarnation; that we make the full journey only by exploring our own actual experience as an incarnational being, as it progressively discloses itself in our practice and our life; and that, in the end, this body is what we realize in all of its dimensions, in all of its subtlety and depth. This is the ultimate spiritual illumination, the long-sought elixir of life, the realization of nirvana. There isn’t anything beyond this for, as I hope to show you, this is the illumination of the totality of Being. We can further clarify what embodied spirituality is by seeing what it isn’t. In many of the traditional religions of both West and East, including many forms of Buddhism, the spiritual life is understood as a process of separating oneself from everything that is problematic and nonspiritual in order to gain higher, “spiritual” states of meditative awareness. And what are these nonspiritual things that one is separating oneself from? All that seems ordinary, mundane, and “worldly”; the body and all that is seated in it, including instincts and sensations; feelings, emotions, and bodily perceptions; human attachment and sexuality; all that feels potentially problematic, chaotic, and obstructive in our life, all that triggers us, activates us, and stirs us up and leaves us feeling confused, troubled, and incomplete. Meditation is often viewed as a way to separate ourselves from all of this and rise above it, to get to an altitude where we can relax into a space that is unobstructed and peaceful. This goal of separation seems to reflect a somewhat negative attitude toward our regular life and the ordinary world as if, at least in a spiritual sense, those things don’t hold very much of importance for us. And so we often practice meditation as a process of progressive distancing and disembodiment, where we are employing meditative techniques to separate what we feel are the “higher” part of ourselves—our more pure, clear, and clean parts—from everything that is lower—all the mundane, ordinary, pained, nagging, struggling parts. This approach leads, as mentioned, to a state of spiritual dissociation. We sit down to meditate and use a technique to try to calm the distress and chaos in our mind, disturbances perhaps fueled by our compulsive thinking, painful memories of unresolved situations or relationships, aggressive competitiveness, and distressing feelings and emotions. We try to smooth the turbulence of all the things that seem to be closing in on us, suffocating us, creating an intense claustrophobia. This tranquilization of our minds is a well-known practice in Buddhism called shamatha, or mindfulness, mentioned earlier. The powerful techniques for this can indeed induce the desired effects and, as our minds begin to quiet down, we may then enjoy a more peaceful and open state. But here is where things get very tricky: the practice of meditation as a process of tranquilization typically implies a conscious intention, a mental image of what we are looking for, and a process of deliberate inclusion and exclusion leading us toward our desired spiritual goal. This is tricky because of our remarkable human capacity to limit and control experience: witness the human ego itself. It has been estimated that out of every million parts of information received and processed by our body, we humans only admit 13 parts into our conscious awareness. That means we only allow ourselves to be conscious of .000013 percent of the data, of experience, known to our body. That capacity to limit and control our experience is operational in the way mindfulness is practiced by many of us, although we may be quite unconscious of this fact. What often happens with many of us is that we are able, with sufficient discipline and willpower, to get ourselves into something like the desired state; but it takes a tremendous amount of effort of separation and exclusion of everything else to get there and it leaves us in a bit of a trance. to be able to rest and recuperate can have considerable benefits. Taking us in quite another direction, the somatic teachings see the spiritual life as a journey toward ever fuller and more complete intimacy and even identification with our human incarnation—and we are not talking about just the “nice” parts. This means surrendering our separate spiritual stance, our “spiritual” self, and falling into contact, communication, alignment, and, finally, union with the most ordinary, basic aspects of our human existence, as they are. These include everything we go through, our whole somatic existence, with its sensations, bodily perceptions, feelings, and emotions—including all of our ordinary mental life, the ups and downs, the confusion, the pleasure and pain, everything. For somatic spirituality, our problem is not, as in conventional spirituality, that we are too close to these mundane features of our life but rather that we are too far away from them; our problem is not that we are too embodied (the disembodied approach), but that we are not embodied enough. The only place we can truly, authentically, and fully wake up is in the midst of life—right in the middle of our quotidian life, exactly as it is. The somatic lineage is thus life-affirming to an absolute degree; it is, in Trungpa Rinpoche’s words, “ultimate positivity”: we walk the path toward realization by abandoning any sense of distinction between our spiritual journey and our life journey that consists of the specific, gritty realities of our ordinary existence; in fact they are one and the same. Many writers in our contemporary culture are articulating these or similar ideas. However, simply having this perspective on a purely intellectual or conceptual level is going to be of limited help for ourselves or our world. If, on the contrary, through the somatic methods, we come to see and experience this for ourselves, it changes everything. We no longer need to be minimizing or denying large parts of ourselves or be engaged in a constant struggle to free ourselves from the mundane aspects of ourselves and our lives. Quite the opposite, we are now fully and thoroughly liberated into a complete acceptance and openness to everything we are, to see for ourselves that everything we go through is an engagement with the heart of reality itself. Moreover, the somatic approach shows us how to meet the most painful and problematic situations, emotions, and people in our life and to find within those difficult aspects of our life the next step on our path or spiritual journey. In short, to see the grittiness of the world and, more than that, to experience it directly as the blessing we have been searching for. The approach of somatic spirituality shows us how to transform the yuck and poison of our own negativity into something fresh, wholesome, and creative. And then, finally, the most simple and ordinary aspects of our human experience become sources of insight, freedom and joy, and revelations of the deepest mysteries of the universe. Thus it is that if we turn our back on our body and our bodily existence—on the ordinary, the commonplace, and mundane—we are turning our back on what is ultimately and finally real; we are giving up our one opportunity to find our own true and destined place within the infinity of being. From Awakening Body, © 2016 by Reginald A. Ray. Shambhala Publications, Inc., Boston, MA. www.shambhala.com. 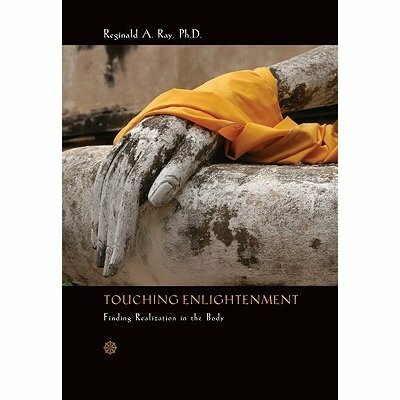 Reginald A. Ray, Ph.D., draws on four decades of study and practice within the Tibetan Buddhist tradition to address the unique spiritual imperatives of modern people. He is the author of numerous books, including Touching Enlightenment, Indestructible Truth, and Secret of the Vajra World, as well as meditation-oriented audio programs, such as Your Breathing Body and Mahamudra for the Modern World. The spiritual director of the Dharma Ocean Foundation, Dr. Ray regularly leads meditation retreats at Blazing Mountain Retreat Center in Crestone, Colorado. For more information, and access to free audio talks and guided meditations, please visit www.dharmaocean.org. The book describes anatta and losing boundaries into total exertion/Maha (cosmic body) expressed in another way through the portal of a body. The practice is similar to Vipassana or Satipatthana. "Reggie Ray’s approach to the dharma is wonderfully fresh while also radically rooted in the foundation of the Buddha’s meditation instruction—mindfulness of body. He has a richly textured understanding of the lived body as the vessel of wisdom mind, as well as the carrier of all the karmic patterns that obscure this pristine awareness. Highly recommended." "This breathing practice also helps us uncover the energy that ultimately is the big toe... ...our seemingly solid physical sensations of the big toe are a substantialized and solidified experience of a more primary experience of the big toe: that it is actually a vibrating, scintillating field of energy... in a sense, we become the energy of the big toe, we are it." "... by sensing it and feeling it, not just as the body does, but as the body. We begin to experience moments when we realize that, fundamentally, "we" are the body. As we find ourselves in greater and greater somatic embodiment, we discover deeper and deeper contact with this world. At this point, our conclusions about it recede into relative unimportance. Life is then less and less about thinking and more and more about simply being." "When we bring our breath consciously into different parts of our body, there is the physical part, in this case pulling the breath in through the pores of the skin. But at a deeper level, there is the inner breath, by which we are bringing the life energy into that particular part of our body..."
"...Now you are breathing through the entire body, through every pore of the entire body, into every portion of its interior, all its bones, muscles, and organs, into all the cells of the body. Just work on that for a few minutes. It isn't easy, but if you stay with it, the energy, attention, and sense of intense vitality will become greater and greater. As you are breathing through the entire body, notice if there are any places that perhaps seem a little dead or a little resistant to the breath, and you can emphasize those areas a bit. You are still breathing through the entire body, but you are ending up in that particular spot, trying to bring more life to it, more energy, more awareness, more feeling of being awake and sensitive and sentient. Continue this for another minute or two. Try to make a lot of effort now, maximize your effort and exertion to the utmost, breathing in through every pore of your body, into every single cell of your body, surface and depth, simultaneously. Then when you think you can't possibly do any more, you can just let go of the technique and lie quietly. Feel the energy circulating throughout your body. This is the inner breath, the prana, which is your vitality, flowing through your nadis, or energy pathways. Your body is now very, very awake, and you can feel an electricity flowing everywhere. Stay with this for several minutes, enjoying it and being completely in the flow. Stay with it until you feel really satisfied. After resting for a few more minutes, you can sit back up. As you do so, continue this sense of the full body, cellular breathing but gently now with a very light touch." "We realize that our body feels, senses, knows its interconnection with all things. In fact, we are, we exist, only in and through interconnection; ultimately, we are nothing other than "interbeing," in Thich Nhat Hanh's beautiful phrase. All of this becomes increasingly clear the deeper we enter into our somatic existence... ...modern science is showing us that there is no solid, impermeable, discrete envelope to our individual body and that we are in constant and open-ended exchange with our larger bodies, just as our brain is with our lungs, our bones with our circulatory system: the same principle, just a larger scale." "We have seen how the interior of our physical body unfolds first as more open than we had suspected, then as the space of our own awareness itself. In our further unfolding, again we saw, we discover that this "interior space" is not limited to our body at all, but is to be found "outside" of us, as a cosmic reality, in the earth beneath us; in this unfolding of our cosmic body, we discover an increasing boundlessness to our own awareness." "...This standpoint, so to speak, of an experience of the earth beyond subject and object opens the way for the unfolding of a different way of being in and with the rest of the cosmos. Initially, we may begin to feel something very strong calling us - calling, calling continually: a mountain we have seen, a glacier, a particular valley, an open vista, a certain hillside or place in the forest, a tree, a river, a lake. We start to sense - although we cannot quite believe it - that the mountain, for example, is alive, and aware, and strongly inviting us, pulling us in its direction. There is something about it that is drawing us to it in the most compelling way. We may dream about it at night and feel its call during the day. What we feel is entirely somatic: our hearts are on fire and its call is resonating throughout our bodies. Such is the depth of somatic life, of *feeling* life, that is now becoming our way of being." "Have you ever been present to a raindrop falling on a window sill, watched its great globule tumbling into sight, splashing on the sill, spreading out in slow motion, and exploding into a thousand specs of light? Have you ever gazed into a campfire, suddenly finding yourself within it, discovering your own state of being as nothing other than the raging inferno, burning, burning, burning, fueled by all it meets? Have you contemplated a lake and suddenly found yourself lost in its endlessly wet and watery world? Have you glanced up into a great tree only to meet an ancient presence looking back at you with immense understanding and care? Have you ever, one day, looked up at the sky and realized with a sudden, electric shock that courses through your body, that you are meeting a vast shimmering awareness, incredibly alive, that is watching you, utterly seeing you through and through, holding you within its boundless love?" "...The mountain is our heart, the running streams, our blood; our mind, the limitless sky; our thoughts, the small passing clouds. Ultimately, we are nothing other than these."